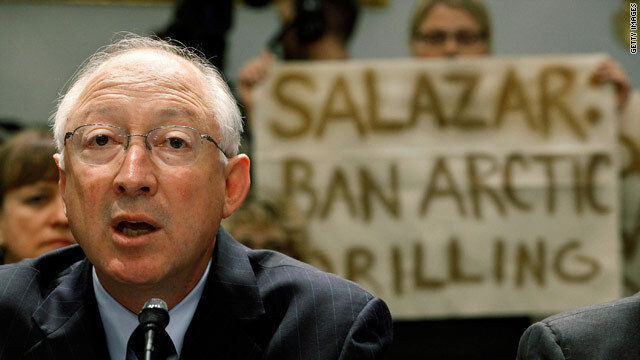 Protesters hold a sign behind Interior Secretary Ken Salazar as he testifies Wednesday before a congressional committee. NEW: Obama says oil companies failed to prepare for "worst-case scenario"
Washington (CNN) -- A stern-faced President Barack Obama on Thursday announced steps to limit new oil drilling and exploration as the investigation of the Gulf of Mexico oil spill continues, telling the American people that he is "fully engaged" and ultimately responsible for what he called a catastrophe. "I take responsibility. It is my job to make sure that everything is done to shut this down," Obama said at the end of a White House news conference. "That doesn't mean it's going to be easy. That doesn't' mean it's going to happen right away or the way I'd like it to happen. That doesn't mean we aren't going to make mistakes." He insisted that the federal government was fully engaged, adding "and I'm fully engaged." Obama's announcement was in response to the deadly April 20 explosion on a Gulf of Mexico oil rig that triggered a devastating oil spill. New federal estimates Thursday determined the spill is likely the largest in U.S. history, with oil already coating parts of the Louisiana coast and the eventual impacts still unclear. The new steps announced Thursday were in response to a report on the Gulf spill by Interior Secretary Ken Salazar that Obama ordered last month. Salazar briefed Obama and senior advisers on the report Wednesday night. Obama said the government would seek aggressive new operating standards and requirements for offshore oil companies. For now, he said, the government was suspending planned oil exploration of two locations off the coast of Alaska, canceling pending lease sales in the Gulf of Mexico and the proposed lease sale off Virginia, and halting the issuance of new permits for deep-water wells for six months. Obama called the new steps part of a broader government response intended to prevent a similar catastrophe from happening again. "We'll continue to do whatever is necessary to protect and restore the Gulf coast," Obama said. At the same time, Obama warned that the situation was dire. "This is going to be hard, not just right now, this is going to be hard for months to come," he said. "The Gulf is going to be affected in a bad way." Noting the growing national anger and frustration at the inability of oil giant BP to cap the leaking well 5,000 feet below the Gulf surface, Obama said he understood why people were upset, particularly those from the affected coastal regions whose livelihoods were threatened. He cited longstanding problems at the Interior Department's Minerals Management Service that resulted in lax regulation of offshore oil drilling, but said he was unaware of the circumstances surrounding Thursday's resignation of MMS Director Elizabeth Birnbaum. The main problem, Obama said, was that BP and other oil companies -- along with federal regulators -- never properly determined or prepared for a worst-case scenario. "On a whole bunch of fronts, you had a complacency when it came to what happens in the worst-case scenario," he said. Obama said he believed BP wanted to stop the leak as much as anyone, albeit for business and liability reasons, but he also expressed reservations about accepting BP's assessment of the extent of the disaster. "We have to verify whatever they say about the damage," Obama said, acknowledging the government had fallen short in that task up to now. Looking forward, he said, the government and the American people must have confidence that future drilling mishaps can be fixed within days, not weeks or months. Right now, he said, that confidence was lacking. Obama also said the oil spill showed the need for the United States to transition from an oil-based energy system to renewable and cleaner sources of energy that are developed and produced at home, instead of imported from abroad. While America will continue to use oil in coming years as part of the transition, he noted that the deep-water well involved in the current spill showed how reserves were more difficult to exploit and therefore included more risk. "The easily accessible oil has already been sucked out of the ground," Obama said. "... We as a society are going to have to make some determinations about what risk we are willing to accept." In reaction to the new steps, Democratic Sen. Mark Begich of Alaska expressed "frustration" about the administration's new roadblocks for the state's oil industry. The decision "will cause more delays and higher costs for domestic oil and gas production to meet the nation's energy needs," Begich said, as well as costing money and jobs in Alaska. Begich conceded that the Gulf spill "highlighted the need for much stronger oversight and accountability of oil companies working offshore," but said Shell Oil "can safely explore for oil and gas this summer in the Arctic." CNN's Suzanne Malveaux and Evan Glass contributed to this report.